The Photoblog theme this week is 'New Inspirations', intended to get everyone out trying new techniques. I decided to try my hand at focus stacking, although that choice did bring some frustrations as well as inspirations! The idea behind focus stacking is to use it when you have a situation where you want everything in your photos in focus but the laws of physics prevent you managing this in one picture. 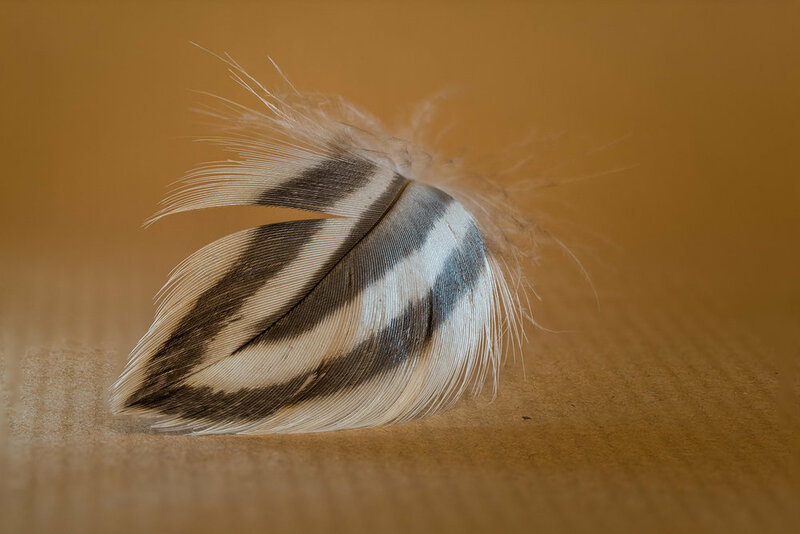 Macro photography is a case in point so I picked this feather and framed up my camera on a tripod. I then took multiple pictures, shifting the focus a little further back through the frame with each one. The next step was to stack these images in Photoshop and let some computer wizardry figure out which bits of each picture. Of course, my somewhat elderly computer found this a huge challenge as it's inevitably lost some of its computing power over the years. Eventually I found a way round this (stacking smaller JPG files rather than the original large RAW files) and the end result has proved to be more successful than I expected for a first try! If you'd like to join in the weekly theme and see what everyone else has created for it do pop over to the Photoblog forum to take a look. You can find it here.